Valerie Brown jumped on the Moishe House train earlier this year and hasn’t looked back! She participated in Moishe House’s first iteration of Act Now Houston in April and facilitated a local Peer Led Retreat in May. At the retreat one of the participants turned to her in the middle of a text study and asked, “Do you think there are other people in DC who like doing [text studies]?” There lies the inspiration for Valerie’s Moishe House Without Walls hosting tenure. Her community sought a need for continued Jewish learning and MHWOW has elevated these experiences. 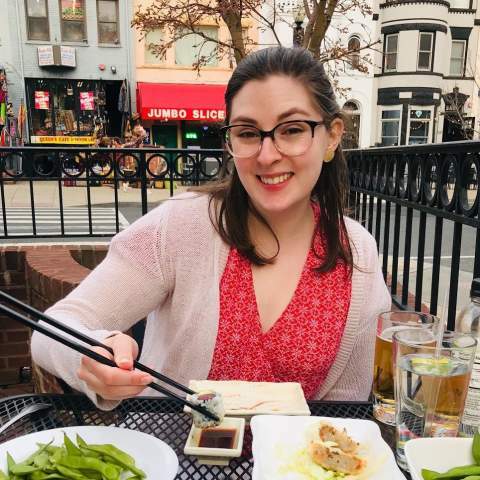 By being able to provide food, welcoming environments, and community to her peers, Valerie is deeply impacting her peers’ Jewish connections. “MHWOW has inspired me to host new and different types of programming, from being able to continue to do text studies with folks from our peer-led retreat to leading a Rosh Hashanah hike! Okay, it was mostly a nature walk, but we did a motzi beneath a waterfall so I think it counts! Valerie Brown works for Jewish Women’s International (JWI), which is an organization working to empower women and girls through a wide variety of mediums. She is their Manager of Marketing and Communications and one of our over 600 active Moishe House Without Walls Hosts.